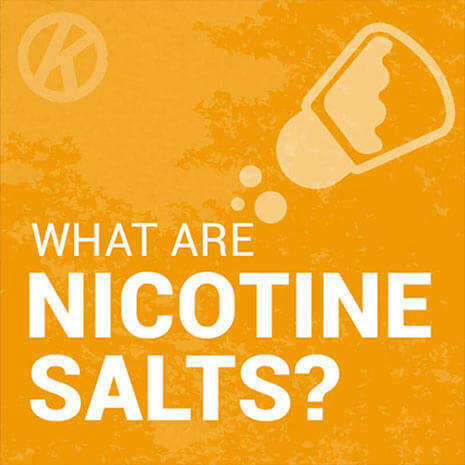 Nicotine salts are made from nicotine extracted from the tobacco leaf and bonded with benzoic acid. The salts vaporise at a lower temperature and with a lower pH level than freebase nicotine (the nicotine used in most standard e-liquids). They can be used at higher concentrations and will produce a smoother, and potentially more immediate nicotine hit than freebase nicotine. E-liquids containing nicotine salts, or ‘nicsalt e-liquids’ are therefore well suited to new vapers making the switch from cigarettes. Most e-liquids contain ‘freebase nicotine’; the purest form of nicotine. The other e-liquid ingredients of propylene glycol and vegetable glycerine ‘carry’ the nicotine in e-cigarette vapour. This form of nicotine is also used in cigarettes and many common nicotine replacement therapies (NRT’s). Freebase nicotine was invented by tobacco companies in the 1960’s. They added ammonia which makes the nicotine more potent and readily absorbed by the body, therefore making cigarettes more addictive. Freebase nicotine is acidic which means that in higher concentration it becomes very harsh to inhale. Even before the TPD regulations, most vapers wouldn’t use e-liquids with more than 24mg nicotine strength as these gave a very harsh throat hit. Nicotine salts are made from nicotine extracted from tobacco leaves. This nicotine is not as readily absorbed by the human body and is less addictive, however, in 2015 a vape company called PAX Labs found that bonding the nicotine salts with benzoic acid lowered the pH value. This in turn created a smoother nicotine hit when used in e-liquids. The addition of the benzoic acid may also increase the speed at which the nicotine is absorbed by the body. This would mean that they give a more immediate nicotine hit than a vaper would experience with freebase nicotine e-liquids. Why Choose Nicotine Salt E-Liquids? Smoother nicotine hit (less harsh). Stronger nicotine strengths can be used for a more satisfying vape. Nicotine salts tend to have less effect on the flavourings in e-liquid than freebase nicotine. Which Devices Can Nic Salts Be Used With? Our range of Nic Salt E-Liquids contain 18mg nicotine and 50% VG/50% PG. The equal PG/VG ratio means they can be used with both classic vape kits and sub ohm vape kits. Please note however that they will be quite strong in a sub ohm kit. If using with a sub ohm kit, they’ll be best suited for vaping at a low power output (10-14 watts). Where Can I Buy OK Nicotine Salts? The full range of OK NicSalt e-liquids can be purchased direct from our online store. We send all orders by free 1st class post and dispatch orders received before 2pm Monday to Friday the same day. The Menthol & Strawberry flavour OK NicSalt e-liquids are also available to buy in most Morrisons stores.